In order to follow the track record of the enemy air crashes accurately, we need to verify and cross check all info before posting any new crashes. All iaf, in &amp;amp;amp; ia air crashes should be reported in, make sure someone else hasn't reported it already. I want to keep an accurate record of the enemy air crashes and compare it ours as well as the rest of the world's air forces. Report by aircraft/rotorcraft type eg. MiG-29, Ka-28, Su-30 etc. Also make sure you cross check by date and location of the craft, as well as if there were any enemy fatalities. Thread Updated on 6th of April 2015!! Edited by Dizasta, 06 April 2015 - 05:44 PM. a few years ago it used to ne one a week. It was a regular news story on this board. mainly the MIG 21's - flying coffins. PAF has had a number of aircrashes this year owing to increased sorties due to combat operations and induction of multiple new F-16s and JF-17s! Panaji, Aug 21 (PTI) An Indian Naval fighter aircraft today crashed off Goa coast, killing the pilot. "The Indian naval 'Sea Harrier' aircraft, which was on a routine exercise mission, crashed at about 1157 hours," a naval spokesman told PTI here. The single-seater aircraft crashed in the Arabian sea 15 miles away from the shore. "Lieutenant Commander Saurav Saxena, the pilot of the aircraft lost his life in the incident," the spokesman added. Bidar (Karnataka), Jan.21 (ANI): An Indian Air Force (IAF) fighter pilot was killed on Wednesday morning after a Kiran trainer aircraft crashed during a training sortie in Karnatakas Bidar district here. The pilot, identified as Wg Cdr R. S. Dhaliwal belonged to the acclaimed Surya Kiran Aerobatics Team (SKAT). Dhaliwal had joined the SKAT only recently and was on the indigenous Kiran Mk II (HPT-16) trainer aircraft in a routine sortie, when the accident occurred at 8.45 hours, said sources in the Indian Air Force. The aircraft, which took off from Karnatakas Bidar district, crashed a few minutes later at a vacant plot near the Air Force station. No loss of civilian life or property has been reported. The latest tragic incident is the second fatal air mishap that involves the Surya Kiran pilots in last three years. The last time such an incident took place in March 2006 at the same air base in which two pilots were killed. Jalpaiguri (WB) Jan 31 : Indian Air Force (AIF) MiG-27 aircraft crashed near Air Force Station Hashimara in West Bengal's Jalpaiguri District today. The aircraft flew from Hashimara airbase and was on a routine flying training by Wing Commander J Singh when it crashed at around 12.40 p.m. Wing Commander Singh ejected safely. There were no casualties due to the air crash. An inquiry has been ordered to investigate the reasons for the accident. An Indian Navy Kamov Ka-28 "Helix-A" helicopter crashed in the Arabian Sea, 22 nautical miles off the coast Goa, earlier day, but the three crew escaped unhurt. The helicopter had taken off from the Indian Navy base at Goa INS Hansa at 11:00 (05:30 UTC) on a routine sortie. Air Traffic Control officials at the Dabolim International Airport, Goa, indicated that the helicopter lost contact with them 20 minutes later. A few minutes later, when a distress signal was received a Navy rescue helicopter was scrambled, which rescued the crew members. The debris of the Kamov has been located and a court of inquiry has been initiated as per an Indian Navy spokesperson. New Delhi, April 30 (IANS) One person was killed when a frontline Su-30MKI combat jet of the Indian Air Force (IAF) crashed while on a routine training mission in Rajasthan, an official said. The crash occurred at 10.30 a.m., some 70 km southeast of Jaisalmer, an IAF spokesperson said, adding that the aircraft had taken off from the Lohegaon air base near Pune. The two-man crew ejected before the jet crashed. The pilot, Wing Commander S.V. Munje, survived but the navigator, Wing Commander P.S. Narah, succumbed to his injuries, the spokesperson added. There were no reports of damage to property on the ground. This is the first crash of a Su-30MKI, which was inducted into the IAF in 1997. The IAF operates three squadrons (approximately 55 aircraft) of the jet, which is being manufactured under license in India by Hindustan Aeronautics Limited (HAL). It was not immediately clear whether the aircraft that crashed was among those purchased in fly away condition or had been manufactured in India. Jodhpur, May 15: Yet another MIG crash is reported from Jodhpur on Friday, May 15 morning. Defence sources said that an Indian Air Force MIG 27 fighter plane crashed at Konkani village, 25 km from Jodhpur of Rajasthan. Five villagers reportedly sustained serious burn injuries at the crash site. The pilot had a narrow escape after he managed to eject safely. The IAF aircraft was on a routine training mission when the mishap occurred at around 0800 hrs IST due to a technical snag. Jodhpur, May 27: In another MIG crash that was reported on Wednesday, May 27, MIG 21 'Bison' plane crashed near Jodhpur, however, the pilot ejected safely. The war plane took off from the Jodhpur airbase in the noon and crashed n a barren stretch land in Luni village in Mordijoshyan, Superintendent of Police (Rural) Kaviraj informed. He added that there was no damage on the ground and that the pilot had ejected safely. This is the third MIG crash reported over the period of one month. The last incident that took place was that of MIG 27 fighter aircraft, which crashed on May 15. There was one involving Sukhoi-30MKI air superiority fighter which crashed near Jaisalmer on Apr 30. An Indian Air Force AN-32 aircraft with 13 people on board went missing in Arunachal Pradesh today and is feared to have crashed in the mountains. The aircraft was on its way to Jorhat in Assam from the Mechuka advanced landing ground (ALG) in West Siang, close to the China border. The Army was alerted and several helicopters were sent out from Chabua, Tezpur and Jorhat but search operations had to be called off due to poor visibility after sunset. The search will resume early tomorrow. Incidentally, it was only today that Arunachal Pradesh handed over eight ALGs, including the one at Mechuka, to the Ministry of Defence Defence Secretary Vijay Singh and Chief Secretary Tabom Bam signed a memorandum of understanding in the presence of Chief Minister Dorjee Khandu at Itanagar. The other ALGs are at Walong, Tuting, Vijayanagar, Aalo, Ziro, Tawang and Pasighat. IAF sources said the Russian-built AN-32, a reliable workhorse, took off at 2 pm from Mechuka but lost radio contact soon. The aircraft had six IAF personnel and “six or seven” other passengers, said to be from the Army. There is no motorable road to Mechuka. Three IAF officers are among those on board. Names and ranks of those in the aircraft have not been released. “Aircraft taking off from Mechuka normally take some time to come into radio contact with Jorhat or Chabua. The Jorhat base suspected something was wrong when the aircraft did not make contact within the expected time,” an IAF spokesman said. New Delhi, Jun 18: Yet another MIG-21 crashed near Chabua in Upper Assam on Thursday, Jun 18. The pilot of the fighter jet managed to eject out safely, Indian Air Force sources said. The aircraft took off from Chabua airbase at 2:00 PM and crashed due to a technical snag. "The pilot reported the technical error to the airbase and later jettisoned the aircraft," an IAF source was quoted as saying in a news agency report. The aircraft was HPT-32 trainer aircraft which had two on board of the Indian Air Force (IAF) on Friday crashed in Andhra Pradesh’s Medak district, killing two who were the instructors. The mishap occurred at about 9.45am when the HPT-32 training aircraft belonging to Air Force Academy Dundigal crashed in an open ground at Annaram village of Jinnaram Mandal near the academy, a senior police officer said. The trainee took off the plane at 0900 hours and with in 45 mins the crash took place and reason to be unknown still. Two instructors Ritin Jain and Chaturvedi were killed on the spot, according to the first information report. Senior Air Force officials rushed to the spot and the investigations are started. NEW DELHI, September 10 (RIA Novosti) - A MiG-21 fighter jet of the Indian Air Force (IAF) crashed in India's northwestern Punjab state on Thursday during a training flight, killing the pilot, national media reported. The accident, which was the seventh Indian Air Force plane crash since the start of the year, occurred in Punjab's Muktsar district. The pilot, Lt. Manu Akhori, was unable to eject on time, the India Today web site said. In the past nine months, six other planes have crashed in India, including a Kiran trainer aircraft, SU- 30MKI, MiG-27, MiG-21 fighter jets, an unmanned aerial vehicle, and a transport An-32. Accidents involving Soviet-designed MiG-21 fighter jets, which were produced in India under a licence and have been used for several decades by the Indian Air Force, are frequent in the country. However, work carried out by Russian specialists since 2003 to improve the planes' reliability has significantly reduced the accident rate. There are currently 200 MiG-21 fighter jets in service in the Indian Air Force. Edited by Dizasta, 14 December 2009 - 03:56 AM. IAF's new policy is to NOT annouce a crash if there are no on the ground witnesses. I am not joking about that. So the only ones that now are you see are those that crash in villages & towns. Nothing off isolated crashes. At the same time they were showing a picture of SU-30s. ????? Good keep it coming especially the Su-30s, Mig-29s and Mirages. Anyone can list PAF version also. We lost an F-16 also. It was an Andra Pradesh CM chopper missing from 18 hours and su-30 mki is searching for it with its night watch capabilities! They've already been developing a "new" system for the past 25 years, buying equipment from many different foreign companies - its called LCA. ha great indian scientist and engineers i praise you.you are great due to your unfortunately unrecognised services to Pakistan indian air force although buys hundreds but ends up with even less aircraft than PAF.I advise to Pakistan civil and military leadership that they should invite indian maintainence engineers to Pakistan and give them highest civil awards for helping Pakistan. An IAF MIG-21MF serial C-1641 crashed near Bhaliana in Punjab on Sept. 10 killing the pilot. The aircraft belonged to No.17 Sqn. - indian air force: 10 fighter aircraft crashed, with the loss of 12 pilots/co-pilots. - indian navy: 1 fighter aircraft and 1 helicopter, with the loss of 1 pilots/co-pilots. - hal & nal: 1 jet trainer and 1 transport aircraft, with the loss of 3 pilots/co-pilots. Edited by Dizasta, 25 October 2009 - 06:45 AM. An interesting find, as clear it is to us that hindustanis are having too much fun crashing their own fighters and helicopters. Now it seems their sharing their trade secrets with others as well!!!! The two-man crew of an Ecuadorian air force Dhruv light helicopter escaped with their lives after crashing the Hindustan Aeronautics-built aircraft during a flight demonstration on 27 October. 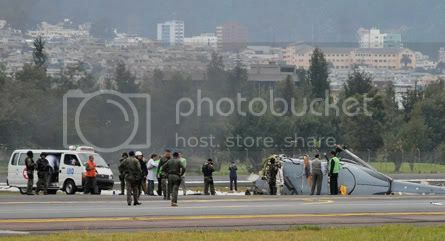 The mishap occurred while the Dhruv was participating in celebrations to mark the 89th anniversary of the Ecuadorian air force, with the aircraft coming down on Mariscal Sucre airport near the capital Quito. Ecuador has so far received four HAL Dhruvs from an eight-aircraft order. The aircraft were delivered to the country in February 2009, according to Flight's HeliCAS database. Initial reports suggest that the aircraft destroyed in the accident was registered as FAE-604. How accurate are these figures? The Figures between 1979 till 1996 cover 60% of all the losses. all figures prior to 79 are just indicative and in no way qualifies as comprehensive. All the incidents before 1994 have been covered by reports from news papers and sources. The Years 1994, 1995 , 1996 are not covered and we had to refer to secondary sources for the figures. 1997 and 1998 have been covered by a Statement released in the Parliament on 11 Mar 99. All figures from April 1999 have been collected by news reports from the Internet. To give you an idea of its coverage, Here are the 'reports' against the available data. Edited by usmanali, 30 October 2009 - 05:25 AM. One person killed as an IAF MI-17 Helicopter goes down in Kashmir on Friday 30th Oct.
Thread updated, indian air force helicopter crash, fatalities unconfirmed. Jalpaiguri, Oct 23 (ANI): An Indian Air Force (IAF) MiG 27 aircraft crashed near New Jalpaiguri about 16 kilometers West of the Hashimara Air Force Base on Friday. According to a Defence Ministry press release, the pilot of the aircraft, Flight Lieutenant Gautam, ejected safely before the aircraft crashed. This is the ninth IAF aircraft and the second MiG 27 crash this year. Earlier in May a MiG 27 crashed in Jodhpur, Rajasthan. The fighter jet was on a routine sortie when it crashed. There was no reported damage to property or life. The IAF has ordered a court of inquiry to investigate the cause of the accident. Since January this year, the IAF lost three MiG-21s at Jodhpur, Chabua in Assam and Baliana in Punjab. One IAF pilot was also killed when a SU-30MKI, was crashed in Jaisalmer in April. Srinagar, Aug 16 (IANS) Two officers and a soldier were killed in a helicopter crash in the Ladakh region of Jammu and Kashmir Saturday. “A Cheetah helicopter of the army crashed in the eastern area of Ladakh region,” sources here told IANS. “Two officers and a soldier were killed in the crash which is believed to have happened because of a technical snag.” the source added. Sources have ruled out sabotage as the cause of the crash. NEW DELHI: Navy has grounded its Sea Harrier fighters, which operate from the country's solitary aircraft carrier INS Viraat, as a precautionary measure after one of the jump-jets crashed last Friday. Sources said the Sea Harrier fleet, which is down to just eight single-seat fighters and three twin-seater trainers now, will undergo systematic checks to ascertain whether a "technical defect'' caused the crash off Goa, which killed the pilot, Lt-Commander Saurabh Chandra Saxena. Apart from the acute shortfall in the number of fighters to operate from the 28,000-tonne INS Viraat, the worry is that the Sea Harrier-IN 622 which crashed was a newly-upgraded one. Though Navy is conducting a "board of inquiry'' into the mishap, the absence of a cockpit voice recorder or flight data recording system on the ill-fated fighter will make the probe all the more difficult. From 1983 onwards, Navy had inducted 30 British-origin Sea Harriers, which take off from the angled ski-jump on INS Viraat and land vertically on its deck, but has lost over half of them in accidents. The remaining underwent "a limited upgrade'' in a Rs 477-crore project, which includes fitting of Israeli Elta EL/M-2032 multi-mode fire control radars and Derby beyond visual range air-to-air missiles, at Hindustan Aeronautics Limited. So, even as the 50-year-old INS Viraat is finally getting ready to become operational for at least five years more after an 18-month life-extension refit, it is fast running out of jets to operate from its deck. This clearly spells trouble for Navy, which has been crying hoarse for several years now that it wants at least two aircraft carriers to protect India's strategic interests. But successive governments have miserably failed to take decisions in time. The 44,570-tonne Admiral Gorshkov, undergoing a refit at the Sevmash Shipyard in North Russia, for instance, will be available only by 2013. The 40,000-tonne indigenous aircraft carrier (IAC), being built at Cochin Shipyard, will also be ready only by 2015-2016. Navy, of course, will soon start getting the 16 MiG-29Ks contracted in the original $1.5-billion Gorshkov package deal signed with Russia in January 2004, under which the carrier refit was pegged at $974 million. India and Russia, however, are still enmeshed in renegotiating Gorshkov's final refit cost, with Moscow demanding as much as $2.9 billion and India keen on shelling out around $2.2 billion. The acquisition of another 29 MiG-29Ks for around Rs 5,380 crore is also on the cards, especially since both Gorshkov and IAC will require these fighters when they are ready to enter service. JAMMU: A body, purported to be that of a missing Indian Air Force officer, was recovered from the Chenab river, eight days after an MI-17 helicopter carrying four personnel crashed into it in Doda district of Jammu and Kashmir. Officials said here on Sunday that the decomposed body, whose identity is yet to be ascertained, was recovered by a joint search party of the Army, the police, the Air Force and the Navy in the Trungal-Assar area on Saturday. The body was airlifted here for identification and completion of other formalities, the officials said. The helicopter that crashed into the river on October 30 was carrying four personnel — Wing Commander Rajiv Garg, Flight Lieutenant Y.S. Tomar, Warrant Officer K. Singh, and Sergeant Deepak. Commander Garg’s body was recovered on the same day. An Indian air force Sukhoi Su-30MKI multi-role supersonic fighter crashed near the Pokhran range in the north-western Indian state of Rajasthan on 30 November. The pilot and navigator managed to eject to safety. This is the second Su-30MKI incident this year after another aircraft crashed near Pokhran on 30 April. The air force has ordered an inquiry into the accident. Thread has been modified with references, authenticating all documented crashes in the year 2009. Please refer to Posts #7 & #23 for articles linked to the crashes. Also, please note that there are no references provided for the privately owned aircrafts of hal and nal. Edited by Dizasta, 08 December 2009 - 09:01 AM. PS: Regarding your signature. Where can i find full version of it? Edited by Magnus, 05 December 2009 - 08:39 AM. ^^ Thank you for pinning this thread, I hope all members contribute toward it and have verifiable sources to back up their input. My signiture is based on the book, "Jerusalem in the Qur'aan" written by Dr. Imran Hosein. You can find this book available online for free! In reference to the recent crash of Ecuadorian Air Force's Dhruv (indian made) helicopter which occured in October. It seems that the indian company, hal (hindustan aeronautics limited), may loose orders from its launch customer, Ecuador! Ecuador could return six helicopters recently bought from an Indian company after one of the aircraft crashed at an air show last week, the Unverso newspaper reported on Thursday. One of the seven Dhruv combat helicopters Ecuador had purchased from Hindustan Aeronautics Limited crashed during an air show in the Ecuadoran capital, Quito, last Saturday, injuring the pilot and co-pilot. Ecuadoran Air Force chief Rodrigo Bohorquez was quoted as saying the contract allowed the return in the event of an irreparable fault. A special commission is investigating the accident. The rearmament of the Ecuadoran Air Force was announced in August. The Latin American country's government said it was ready to buy aircraft from Brazil and South Africa. In late September, Ecuadoran President Rafael Correa said combat aircraft from any nations, be it Venezuela, Colombia, the United States or Israel, would be welcome as gifts. Venezuela has already given Ecuador six Mirage-50 planes it had substituted with more advanced Russian Sukhoi jets. Last year, Ecuador also received three Russian Mi-17 helicopters to carry out defense and patrol missions. After Moscow talks between President Dmitry Medvedev and Correa on Thursday a contract was signed on the delivery of two Mi-171E helicopters." For 2010 in, iaf and ia crashes, please view post #1. Edited by Dizasta, 16 January 2012 - 06:32 AM. New Delhi/Shillong: An IAF MiG-27 fighter jet today crashed near Hashimara in West Bengal killing its pilot in the first such mishap this year. "The MiG-27 crashed today and a pilot was killed in the mishap," an IAF officer said here. The aircraft had taken off from Hashimara air base where a fighter squadron is based and was doing a sortie to Bagdogra when the mishap happened. Wing commander Oswald who was flying the aircraft was killed in the aircrash, the officer said. The aircraft had taken off from Hashimara and within a few minutes he reported fire in the engines before it crashed within the airbase around 2.15pm. The Eastern Air Command headquarters in Shillong has ordered a probe into the incident. Last year, there were 11 air crashes including a couple of MiG 27s, denting the IAF's air safety record. NEW DELHI: An Indian Air Force MiG-21 combat jet crashed soon after take-off from Bagdora in West Bengal on Friday but the pilot ejected to safety, an IAF spokesman said. "The aircraft crashed around 3pm soon after take-off and the pilot, squadron leader Rahul Tiwari, ejected safely," the spokesman added. "The pilot was picked up by an SAR (search and rescue) helicopter and has been taken to hospital," the spokesman said. This is the second crash of an IAF fighter in three days. A MiG-27 had crashed near the Hashimara air base, also in West Bengal, on Tuesday. I imported a dog from India for some reason, he keeps barking at my neighbors. In reference to the indian air force helicopter crash on 27 February 2010. New Delhi: An Advanced Light helicopter "Dhruv" of the Indian Air Force on Saturday crash-landed in Rajasthan's Jaisalmer district while rehearsing for the "Vayu Shakti" air power show to be held there on Sunday. The helicopter was part of the Sarang Helicopter Display Team of the IAF and was rehearsing for tomorrow's air show, when the incident occurred, IAF officials said here. "Both pilots are safe after they had to make a controlled crash-landing due to loss of power in the chopper," they added. The IAF has ordered a Court of Inquiry to look into the reasons behind the incident, the officials said. In 2005, the entire ALH Dhruv fleet had been grounded for several months after a similar incident in Andhra Pradesh and the subsequent probe had found a fault with the tail rotor blades of the choppers. On whether the display team comprising four ALH Dhruvs will take part in the air show on Sunday, for which the President and the defence minister are also coming, they said, "Sarang's participation is not yet cancelled." Hyderabad, Mar 3: Two Navy pilots and a civilian died when a Navy plane crashed during the air show near Begumpet airport in Hyderabad. Buzz up!According to reports, the aircraft crashed into a two-storied building while performing an aerobatic manoeuvre with three other aircraft. An HJT-16 Kiran Mk2 trainer built by Hindustan Aeronautics, crashed a couple of minutes before noon. NEW DELHI: An Indian naval plane taking part in an aerobatics display in the city of Hyderabad crashed into a residential area on Wednesday, killing both pilots and destroying a house, the navy said. The NDTV channel showed the plane flying in a formation at the air show in the southern city shortly before it crashed into densely populated land adjacent to the show ground. A three-storey house was destroyed and other buildings were damaged. â€œIn the final phase, the aircraft appears to have gone out of control. They crashed into a building and the pilots have died,â€� navy chief Admiral Nirmal Verma told reporters. He was unable to say if there were further casualties on the ground. The accident occurred on the opening day of the India Aviation 2010 show, a five-day civil aviation exhibition. Ecaudor has confirmed that the crash occured due to pilot error. HAL Dhruv's have resumed their service with Ecuador Air Force and 2 more Dhruv's are ordered by Ecaudor. Looks like someone is working really hard at copying and pasting my list of indian air force crashes of 2009!! Kochi, May 5 (IANS) An unmanned aerial vehicle (UAV) belonging to the Indian Navy came crashing down near the Southern Naval Command airstrip here Wednesday, informed sources said. The Israeli-built Searcher UAV lost contact with the special control tower of the naval base at 7.25 p.m and soon came crashing down, the sources said. No damage was caused since the 63-kg aircraft fell in an uninhabited area. The UAV is fitted with a few cameras and is used to monitor sea traffic. It is capable of flying for close to 10 hours at a stretch and beams live pictures in real time to the control tower. Four Army personnel, including a major, were on Sunday injured when their helicopter crashed in Leh district of Jammu and Kashmir. The Chetak helicopter which was transporting a patient Lance Naik Madhu Prasad crashed at Chipskang injuring four Army personnel including the pilot, Major Panchak Rawat, a police spokesman at the Leh control room said. The other injured were Armymen Atul Chavan and D.R. Singh besides the patient, they said. The injured have been rushed to the Leh hospital. The cause of the crash was not immediately known. Note: According to Key Publishings, the crash occured in the Ladakh division. The news paper (the hindu) reported that the crash took place in Leh. In reference to MiG-21 crash of the indian air force on 15th June 2010. A MiG-21 fighter aircraft of the Indian Air Force on Tuesday crashed near Halwara air base in Punjab, but the pilot bailed out safely.The crash took place at around 11.15 hours just outside the Sidwan Khas Range in Halwara, 33km from here. "A MiG-21 aircraft crashed around 11.15 hours near S K Range near Halwara air base. The pilot ejected from the cockpit safely," an IAF spokesperson said in New Delhi. "The pilot had flown the plane from Pathankot air base for a routine armament training sortie at the range in Halwara when the mishap occurred," he said.